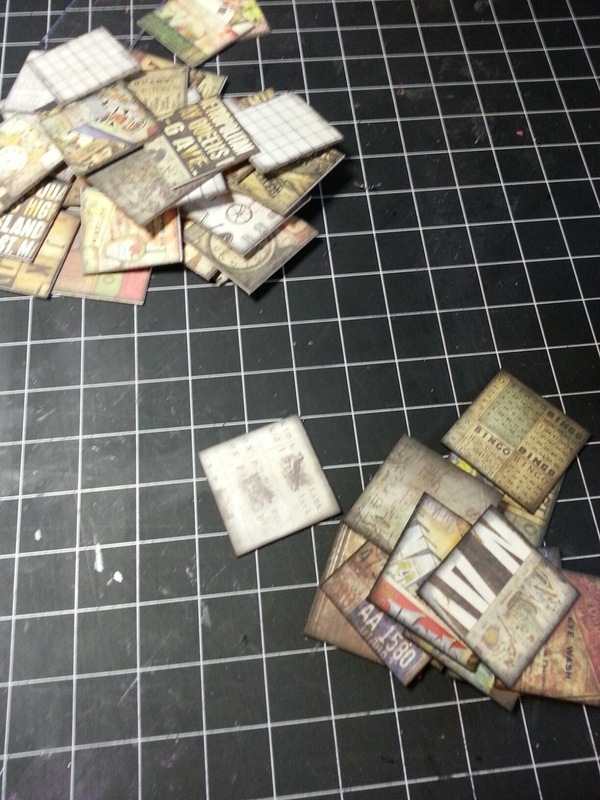 The Gentleman Crafter: Tile and Tax Time! Guess What? Come on....You can guess....MY TAXES ARE DONE!!!!!!! YAHOOOOOLIO! Without ink or coffee stain on them even!!!! Don't I get a deduction for that too???? LOL! Oh I am so relieved to have that done! I get a bit of a refund...OK, enough to buy a small coke and a Happy Meal at McDonald's, but it something right? Bahahahaha! What a big dark cloud over my shoulders lifted! Yahooo and Yahooo again! Just want to take a second and thank you for coming over to my Secret Sunday on Ustream Today! I had no idea what we were going to get into...hence the reason it's a secret and I'm loving the project! I so wanted to finish it, but Shari...convinced me to wait until next Sunday so we could all do it together. It's gonna be cool! It's one of those things that you just have to look around and find inspiration and low and behold...We did! A birdhouse clock thing! LOL! Can't wait to finish it with you guys next Sunday! Maybe I could do just a little to it tonight???? I guess not. Better save it! So, after the show we all streamed over to Fi's to watch her go at it with miniatures. OH MY GOSH! There are some things that I am willing to tackle and some things I just NEED to just sit back and say, "WOW! These folks can work with the tiniest little things and have enough patience to not throw it across the room in frustration"....Simply amazes me. I decided that the best thing for me to do was to work on my tiles. Here's the scoop...I have a cabinet that came out of the barn when I tore the kitchen out and remodeled. I stored chainsaw oil, motor oil and some insecticides in it and thought to myself, hey why not use that in the house to store my dies! Yep! It's a guy thing maybe! LOL! I cleaned it up and brought it in. It was finished with a a light oak stain that has dried up and gone the way of the cuckoo...So it needed something! That's when the tile thing hit me! So I have decided that it's going to take sixty-four 2x2 tiles to cover the front trim pieces. So, tile making... I am! Got a whole 16 done done and have a few more to go! LOL! 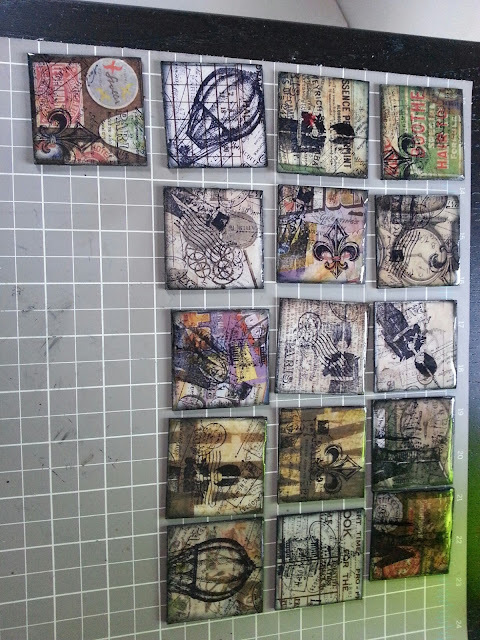 But I'm having a blast doing it....I'm not doing anything crazy wild with the tiles, just covering them with pattern paper and then stamping them. Last, I've gone over them with Glossy Accents and allowed them to dry. Well just wanted to check in and say thanks again for today! Have an awesome start to the week! Jim, I enjoyed watching the clock project today. Love the 2x2 tiles. I'm going to do something similar in my art journal. You have more completed than I do. HOORAY FOR YOU!!! Taxes done!!! Love the tiles...can't wait to see them on the cabinet. Please take a picture of the cabinet before you put the tiles on so we can see the before and after...should be COOL!!! The tile project sounds interesting... now you have to show us the cabinet!! Yea! I know what you mean about the taxes, Jim...things like that get in the way of our being creative! Love the idea of the tiles...have fun...catch you on the 'stream! Yahoo on getting your taxes done. Cool tiles. Looking forward to seeing the completed project. Jim, I do appreciate you waiting for us to finish off the birdhouse clock. It's so fun having you show us all the little steps you take to make your projects over the top. I'm glad you got your taxes back and get to enjoy a delicious Happy Meal! Love the tiles and can't wait to see your cabinet finished. Have a great week, I have to work Tues. evenings all this month so don't forget to record on Tuesday. I can sure appreciate your relief at having your taxes done. I work for a CPA and we are working LONG days right now. I've put together over 400 returns so far, not crafted in two months, and one more stinkin' week to go! Give me strength! Your tiles are delightful....the cabinet is going to be outstanding. Hope to join you on Tuesday and Sunday soon! Love the tiles! Another inspirational post! Thanks! Hi Jim, The tiles look fab so far. Looking forward to seeing the final outcome. 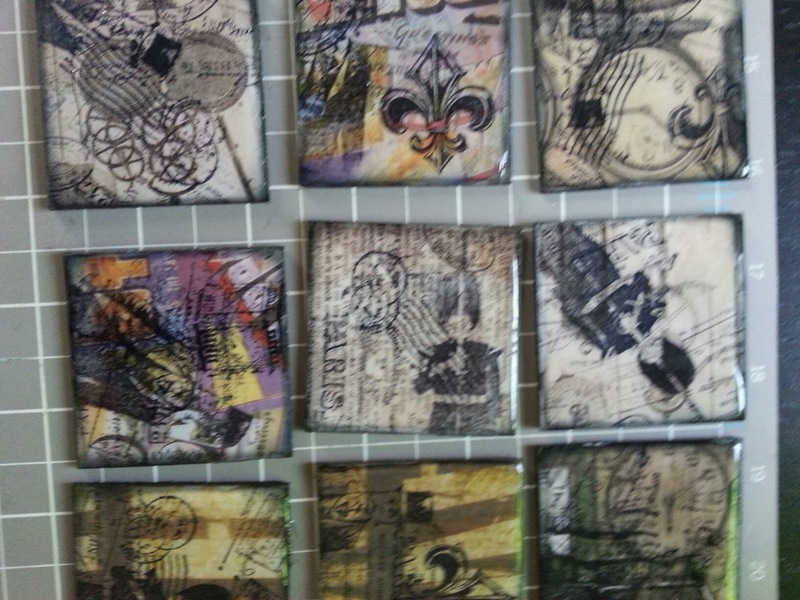 The Tiles are going to look AMAZING on your Cabinet. I have a kitchen cabinet outside holding oils, tire stuff, ant killers and such..... Maybe I could do that...... naw, I'll just live through you and say WOW!!!!! Well done on completing your tax return! Your tiles look great - can't wait to see the finished cabinet. I'm sorry I missed your Ustream yesterday - I did check in, but you'd already been and gone again (I'm not sure what the time difference is between the USA and UK at the moment). It was my birthday yesterday, so I was busy making a special dinner for us. Hugs to you and Cesar. Love the tiles Jim...love em! Love the tiles! I have a dozen or so as well (not as many as you have), but enough to have fun playing. It's a great idea! You are so talented! Awesome start... Love the tile idea!!! They look fabulous... I bet Michael will find something to redo now! LOL! Have a wonderful day and see you next Sunday... don't think I (We) will make it to Tuesday nights stream! Booo! Taxes done and a week early! It's gotta feel great. Talk about making the most out of one weekend. You can be off to work with no regrets. Of course, I'd like to see the cabinet too. The tiles are going to create a unique storage piece that adds more character to your studio. I say, keep your Tim feet in it. Lol. First of all, Happy Belated Birthday, Lynn Hardy. Yeah to Jim on the taxes being done. Ya wanna do mine??? Love the tiles, great way to use up scraps & update the storage. I'm bummed I mised Surprise Sunday, AGAIN. Is there a time you do that at? I can't wait to see the Tuesday show, I even set my alarm so I don't miss it. Thank you! Yes I agree - we need to know what time Jim will be streaming as I keep missing him too :( Setting an alarm is a good idea! Loving you tiles, Jim. I was running about when you were streaming, so I need to catch up. I am still working on taxes, yikes! Happy for you. 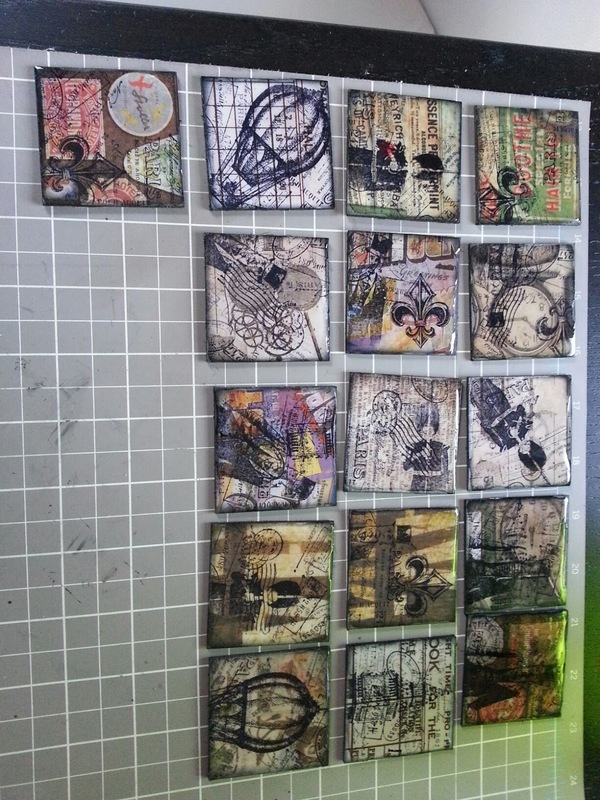 What a cool idea Jim, love those tiles... cool stamps! Still trying to get my mojo back... still recovering from my hospital stay ! Aaaawwwweee Jim, what a great idea. Your die cabinet is going to really look cool. Good idea. I really need to come up with a better way to store all my sizzix dies myself and my punches. I don't know why we do that to ourselves with taxes, but we do. Maybe if you start on next year's taxes now, you will have them done by Feb 2014. I always think that way, but by May, I have forgotten all about it. I can't wait to see that cabinet, I have a doll armoire out in the shed, that I have been saving to alter. You just might get me to tackle it! Dude, brother, you fell and hit your head! Crazy. But I cannot WAIT to see the finished project!